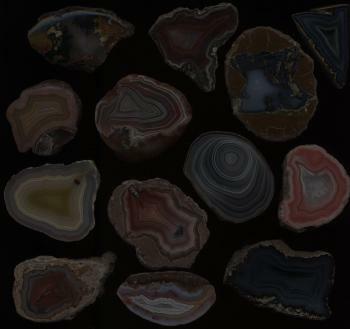 Behold, the agates which can be considered prettiest and strangest of any rocks. Basically, agates are made up of the films of quartz microcrystals which each film/band represents each wet period/season similar to the tree growth rings but in reversed way sometimes in an unexplainable manner. The impurities such as iron oxide ("rust") provide a wide variety of colors to the agates. The agates come in a wide variety of forms from amygdaloidals (gas bubbles in lava) to "Lithophysae ("thundereggs"). What's the Difference Between Amygdaloid Agates, Thundereggs and Sedimentary Agates? Examples: Laguna Agates, Lake Superior Agates, Agate Creek Agates. Examples: Kentucky Agates, Fairburn Agates & Tampa Bay Agatized Corals.